The Birdhouse @ www.thestlcardinals.com the online leader for exclusive, objective and independent coverage of the St. Louis Cardinals, providing the ultimate fan experience through community interaction with our team of experts, writers and reporters. Murry M Dickson was born in Tracy, Missouri on August 21, 1916. Dickson began his pro career with Grand Island of the Nebraska State League in 1937. He made single game appearances with the St Louis Cardinals in 1939 and 1940. After posting a 21-11 record at Columbus of the American Association, he joined the St Louis Cardinals in 1942, posting a 6-3 in 36 games with an excellent 2.91 ERA. In September 1943, Dickson joined the Army, but at the request of baseball commissioner Kennesaw M Landis, was granted a 10-day furlough by Seventh Service Command to pitch in the 1943 World Series, and pitched two-thirds of an inning in the final game. He is one of only two members of the armed forces to appear in a World Series. In 1918, Fred Thomas was on leave from the Navy when he appeared in all six games of the World Series for the Red Sox. Dickson was stationed at Fort Leavenworth, Kansas in 1943. He was later stationed at Fort Riley, Kansas, Fort Meade, Maryland and Camp Shanks, New York, before leaving with the 35th Infantry Division for Europe on May 12, 1944. He arrived in Liverpool, England on the 26th and on July 7, he reached mainland Europe. For 10 months, Dickson advanced through Europe with the 35th Infantry Division as the driver of a point jeep. He was in combat at the breakout at St Lo, the Battle of the Bulge, the crossing of the Rhine and the final thrust through Germany. On one occasion he was forced to dive into a foxhole to avoid enemy fire. Shortly afterwards, someone else jumped on top of him. It turned out that this man was General Patton. After they got out of the fire and were able to retreat to the safety of their lines General Patton asked Dickson to become his personal jeep driver to which he reclined. He later said "no way, Patton is nuts, he doesn't think anyone can kill him." Fortunately for Dickinson he refused the job, as Patton was killed in a jeep accident in France shortly after the war. When the war ended, he traded fatigues for flannels and pitched the 35th Infantry Indians to a series of victories in exhibition games in Germany and France. When Dickson returned home he had with him a vast assortment of "souvenirs" including German hand guns, cameras, binoculars and watches. Dickson was back with the Cardinals in 1946. Less rugged than most pitchers at 5-foot 10-inches and just 155 pounds, he relied on a rich assortment of pitches and delivery angles. His repertoire boasted six types of pitches (fast ball, curve, slider, knuckler, sinker and screw ball. "Sometimes early in a game,” he told Time magazine on April 12, 1948, “some of them aren't working so well. So I drop the bad ones and stick with the ones that will do me the most good." He finished 1946 with a superb 15-6 won-loss record, and his .714 winning percentage was the National League's best. The Pirates paid $125,000 for him in 1949, and he rewarded them with a 20-win season in 1951. Dickson remained in the majors until the age of 43 and never seemed to get a sore arm like many of his contemporaries. "I had a sore arm in St. Pete back in 1940,” he told Time magazine. “The fellows asked me to go bowling, so I went . . . suddenly I felt a pricking pain in my forearm and elbow, but I kept bowling. When I finished the game, the pain was gone. I've never had a sore arm since." 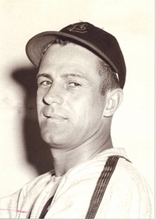 Dickson also played for the Phillies, Athletics and Yankees before retiring after the 1959 season. He worked at his home in Leavenworth, Kansas as a carpenter until he passed away in 1989, aged 73. In 1995-96, Dickson's wartime photographs were on display at the Baseball Hall of Fame, Cooperstown. He was inducted into the Kansas Sports Hall of Fame in 2004. Created June 4, 2006. Updated April 12, 2007.